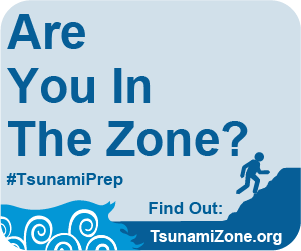 The following materials are available to you to help spread the word about Tsunami Preparedness Week (and encourage people to plan their own preparedness activities). Download these PDF files that can be printed at 8.5x11 as flyers, or printed at a larger, proportional size of your choice. Download these PDF files that can be customized and printed at size or larger for Tsunami Walk events. Download and use the Tsunami Walk Guide too! These banners are shown to scale except when noted.